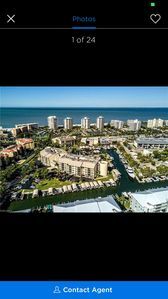 Views of Estero Bay greet you each morning from Casa Marina 353, a beautifully decorated Fort Myers Beach condo located above the wide canal. From our 3rd floor condo, you’re high enough to be out of the fray but low enough to easily observe the boats sailing past. 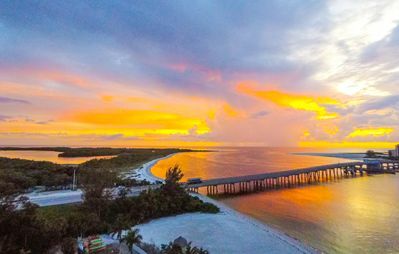 The sunrise will greet you each morning over Estero Bay. Everything you need to enjoy the perfect vacation getaway is close at hand. 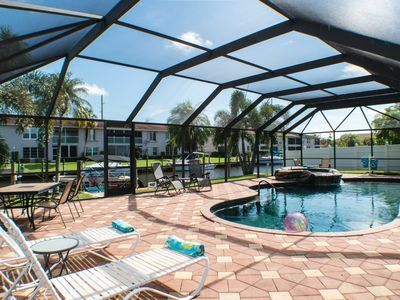 Your only task is to sit back, relax and enjoy this Florida paradise. 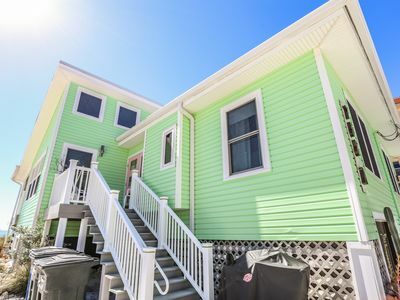 Casa Marina 353 is a lovely two-bedroom, two-bathroom air-conditioned condo that sleeps 4 and is loaded with the creature comforts you want in a vacation home. 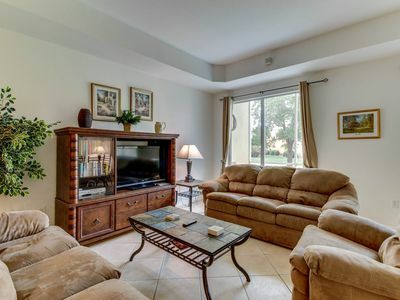 The large living room has a very comfortable sofa and love seat. The living room’s comfortable leather couches are ideal for curling up and watching a movie on our 70" Smart TV. There’s also free Internet, which can be a big help when researching restaurants, recreation options and beaches in the area. 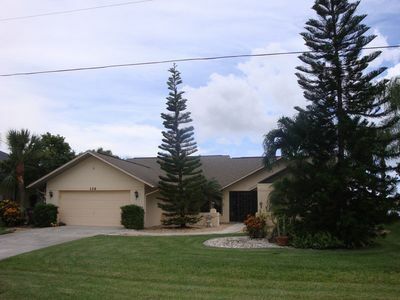 Through the sliding glass doors is your private balcony overlooking the canal and Estero Bay. Beautiful grounds with palm trees, lake and fountain surround the building and add to the complete serenity of the scene below. 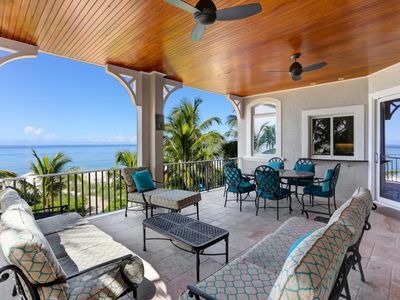 You’ll enjoy watching a sunrise or enjoy the afternoon shade from this balcony as you breathe in the gentle ocean breezes from the beach located just minutes from your condo. 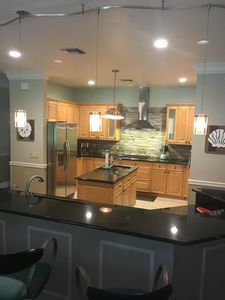 The Casa Marina 353 kitchen is a true pleasure for the chef. A full complement of appliances punctuates the expansive counter tops, ideal for meal preparation. Family members can pitch in to help without getting under foot by pulling up a stool at the breakfast bar. The pass-through window makes it easy to share snacks with the gang watching TV, and the dining room is right next to the kitchen to make serving there a snap as well. 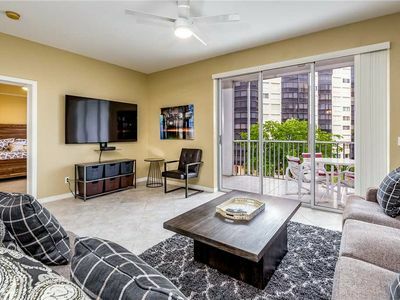 The master bedroom with comfortable king-sized bed has its own balcony access as well as a 60" Smart TV positioned perfectly for late night viewing. The second bedroom includes two twin beds. Each bedroom has its own bathroom. The master bathroom offers a shower and the second bathroom has a tub/shower combination. Both include vanities with large mirrors and all the towels and washcloths you’ll need. The condo also includes the added convenience of a washer and dryer. 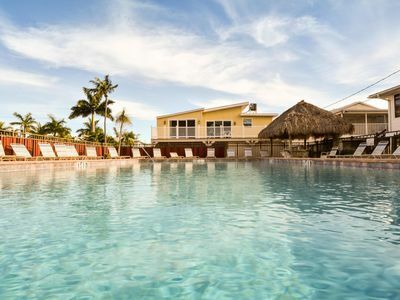 Casa Marina 353 complex offers a large heated swimming pool perfect for swimming laps, or pull up a chaise lounge and read a book while you work on your tan. 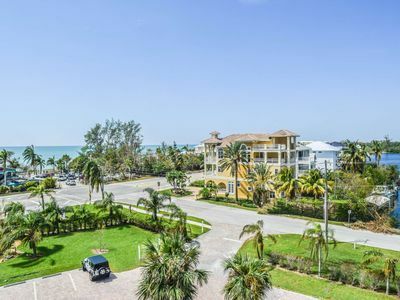 You’ll especially love the location of Casa Marina 353. It’s within walking distance of Santini Plaza with its restaurants, shops and the beautiful marina. 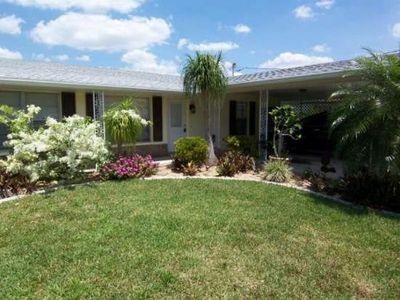 You are also just a short distance from the sugar sand beaches of the open Gulf. A couple minutes by car and you’ll be dipping your toes into the turquoise waters of the Gulf of Mexico. You’ll also want to make the short drive to Lovers Key State Park for wildlife watching, hiking, picnicking and kayaking. It’s just a short ways away and it offers experiences you can’t get anywhere else. Are you a beachcomber? If so, you’ve found your paradise. Visit any of our beaches at low tide to collect shells, driftwood and maybe even some colorful sea glass to take back home. 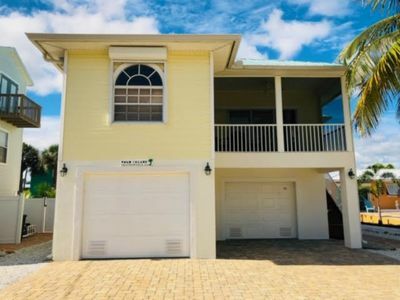 There’s no end to the possibilities and no place that puts you closer to the fun than Casa Marina 353. 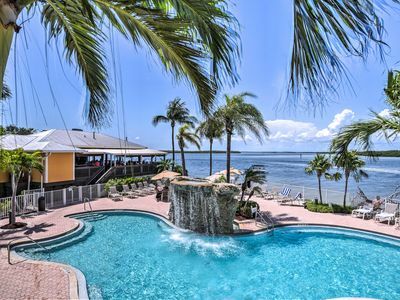 Book your reservation soon, so you get your preferred dates in beautiful Fort Meyers Beach. 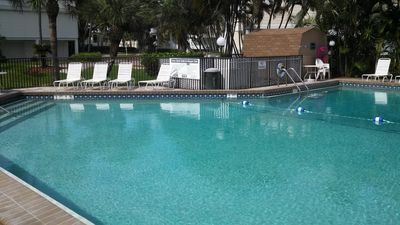 Pool, Spa, Canal, Dock, No Sec Dep, Yacht Club, Boat Available for Rent. 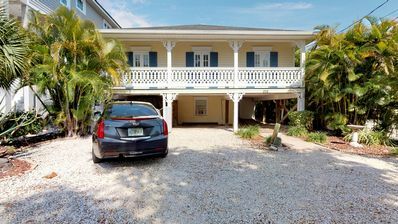 Beachfront duplex at north end of island near Times Square. 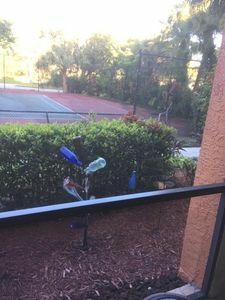 PET FRIENDLY 2 bedroom, 1 full bath, right on the beach. 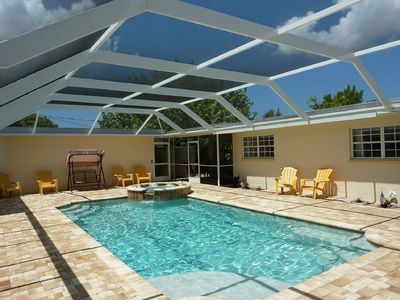 Family-friendly townhouse w/ shared pool - close to golf, beach & more! 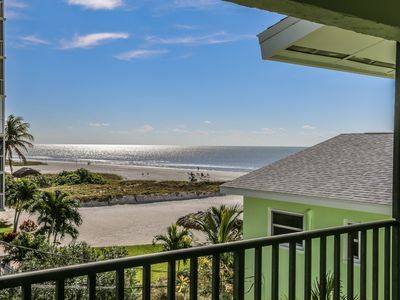 Gulf Views, 4 Min Stroll to Beach Access/ Doc's Beach House! Free Beach Parking, Beach Gear, & Wifi! Welcome to Santa Maria 310, a little piece of Paradise! 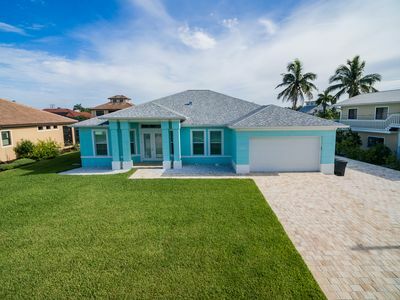 Sandcastle A Newly constructed stunning spacious home close to everything! SPRING SAVINGS!! Perfect Vacation Spot for Two!